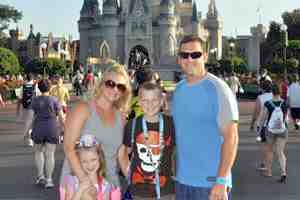 A frequent area of confusion for Disney guests is the topic of tipping at Walt Disney World. International guests may be unfamiliar with American tipping in general. There are some Disney travel situations where guests tip differently than at other travel destinations. And some folks are just plain miffed that they have to tip at all. Nonetheless, gratuities are a part of life when you travel in the United States. To answer all your Disney World tipping questions in one place, here's an overview of all the situations where you have to tip, and where you don't have to tip, on your Disney vacation. Disney table service restaurants provide information about tipping. If you're at the airport and you use a porter to assist you with moving your bags from the luggage carousel to ground transportation. Again, the porter gets $2-3 per bag. If you’re at a Disney hotel and using their Resort Airline Check-In service, tip the luggage handler their just as you would a porter at the airport. If a hotel bellman assists with bringing your bags to/from your room, tip $2-3 per bag. If a hotel bellman also provides you with a resort tour or other help, tip a bit extra. If you’re looking to economize, you can avoid a lot of tipping if you transport your bags yourself. This may not be feasible for guests with medical challenges, copious amounts of luggage, more small children than adults, or owners of non-wheeled luggage. However, if you’re able-bodied and each member of your party can handle their own rolling bag, then by all means deal with your own luggage and circumvent the tip stream. This is an easy way to save cash. And speaking of cash, porters, bellmen, and other luggage handlers should be tipped in cash. There is no other mechanism with which to do this. When you're traveling, plan to carry a bunch of small bills with you. Transportation, Magical Express Drivers: You’ll see a sign at the front of the bus telling you that driver will accept tips. If you’re just hopping off and on the bus, you shouldn’t feel obligated. However, if the driver is helping you store luggage under the bus, go by the $2-3 dollars per bag rule. If you’ve used the yellow Magical Express luggage tags and had Disney take your bags directly to the hotel for you, then you won’t see the person who’s doing your luggage transport. In this situation, you’re off the hook for tipping. Transportation, Limo or Town Car Drivers: Depending on the agency you’re using, the tip may be included in the price. Be sure to ask this when you set up your booking. In general, plan to tip about 15% of the fare. If the driver has done something extraordinary for you, such as making an extra stop or assisting with car seats or colossal amounts of luggage, tip more. Transportation, Taxis: Taxi drivers also get about 15-20% of the fare. Again, if the cabbie does something above and beyond, tip more. Most of the taxis in the WDW area have credit card readers. They typically have a button that you can push to add 15% or 20% to your fare at the end of the ride. For shorter trips on WDW campus you may end up with a ride that costs $7. If you’re paying with cash in a situation like this, it’s often easier for both you and the driver if you round up to $10. It’s considered poor form to tip the driver in coins. Always round to the next higher dollar in your tip if you’re paying with cash. If you’re paying with a credit card, choosing the percentage tip button is sufficient; you don’t have to make it a round number. Taxis are one situation where asking for change for the tip is OK, if you are paying in cash. For example, if your cab ride is $11 and you have a twenty in your wallet, it’s perfectly acceptable to say to the driver, “Here’s a twenty, can I have six back, please.” This tells the driver that you’re paying the fare and giving him a $3.00 tip. Transportation, Ride Sharing Services like Uber or Lyft: Back in the day, tipping was not a part of ride sharing. In recent months, this has changed and tipping for shares has become akin to tipping for cabs. You can do this via the app with which you called the ride, or in cash. If you’ve had a good rapport with your driver, you could ask him or her which is their preferred method. As ride sharing is still emerging technology, understanding protocols is a moving target. If you’re an infrequent users of these services, you might want to check in with a more experienced friend to see if the prevailing wisdom has changed. Transportation, Minnie Vans: The Minnie Van service is a gray area in the world of tipping. Because this is a ride-sharing service but staffed by Disney Cast Members, tipping is not required. On the other hand, for excellent service, you can certainly offer a few dollars in cash or ask if they can accept a tip through the Lyft app as a way of saying thanks. Again, this is a new situation with evolving protocols. Most restaurant receipts calculate a typical tip amount for you. Valet parking: The deluxe level resorts and many off-site properties have valet parking available for a fee. If you use the valet parking service, in addition to paying the daily rate you’ll need to tip the attendant each time you get your car. Two to five dollars is typical. Many guests tip both the attendant who parks their car and the one who retrieves it for them, but only the second tip is strictly compulsory. Housekeeping/Maid Service at Your Hotel: It’s polite to leave about a dollar per day, per person in your party, as a tip for the cast members that make up your room. If you’re a family of five, this means a five dollar tip for your housekeeper each day. You’re supposed to leave the tip separately each day, rather than at the end of your stay, because there likely will be different people cleaning your room over the course of your visit. You’re also supposed to leave the tip with a note that says “thank you,” or in an envelope with the word “housekeeping” on the front. This makes it clear to the housekeeper that the tip is indeed for her, and not just a bit of cash that you forgot you left on the dresser. Some folks employ the strategy of leaving the housekeeping tip on their pillow. If you or your child have been super messy or ill, please leave a more. Additionally, If someone does an extra chore for you, offer a tip. For example, if you call down to housekeeping for more pillows or towels, give the person who brings them a few dollars. Front Desk Concierge Service: Every Walt Disney World hotel has a concierge desk where you can ask directions, pick up tickets, get assistance with dining reservations, etc. For basic requests, there’s no need to tip. If you find a concierge particularly helpful or if they make multiple meal or recreation reservations or solve a thorny problem for you, offer a tip of $5-10. Most likely this will be firmly, but politely, declined, but it’s kind to offer. If you’re staying at an off site hotel and a concierge there provides you with assistance, you should tip $5-10 for simple requests, and $20 or more for complicated requests. This most assuredly will not be declined. Concierge Suite Service: If you’re staying in a Club Level room with special dedicated concierge service, you’ll want to tip according to your usage of the service, the length of your stay, and the number of people in your party. Fifty or 100 dollars, or much more, is not unheard of if you’ve made extensive use of their personal attention. Parties of six or more. 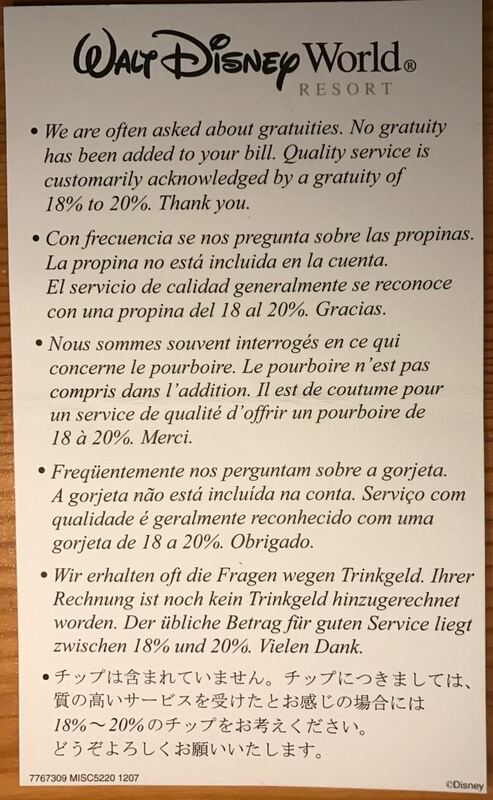 An 18% gratuity will be assessed regardless of the age of the guests (babies are included) and regardless of whether the bill is broken up into separate sub-checks. Guests dining at prepaid restaurants and dinner shows including: Cinderella’s Royal Table, Hoop Dee Doo Review, Spirit of Aloha Luau, and Mickey’s Backyard BBQ. Guests using the Tables in Wonderland discount card or Cast Member discount. If you fall into one of these categories, take extra care to look over your bill. You’re certainly welcome to add more to your tip if you received exceptional service, but you don’t want to inadvertently double tip. One tiny bit of cost saving news here: Your tip should be calculated on the pre-tax cost of your meal. There’s no need to tip for the sales tax. Buffet Service Dining: Servers at Disney’s buffets work just as hard, if not harder, than those at traditional table service restaurants. There’s a lot more clearing and refilling than at other meals. The norm is to tip buffet server staff the same as traditional table service staff. However, if you feel that buffets are in a different category of dining, then it’s up to you to decide your tip level. But remember, if you’re a party of six or more, an 18% gratuity will be automatically added to your bill. Disney Dining Plan Users: Tips are NOT included with meals paid for with Disney Dining Plan credits. You will need to tip your server with actual money (cash, credit/debit cards, Disney gift cards, and other payment methods all work for this). If you’re on the Disney Dining Plan, your bill will include a notation about how much you would have paid had you been paying cash. Tip based on that amount. If you’re a big eater on the Dining Plan, your tips over the course of a vacation can end up being quite substantial. Be sure to factor this into your budget. Bars/Lounges: If you’re just having drinks, $2-3 dollars per drink is the right amount. If you’re also getting food, go with 18-20%. Room service (in-room dining): The In-Room Dining menus state, “A $3.00 delivery charge, applicable sales tax, and an 18% service charge will be added to all orders.” It’s not obligatory, but if the server who brings your food to your room is extra nice or helpful, you could hand him $3-5 to be extra nice back. Salon/Spa Services: Plan on tipping 15-20% of the bill for any personal care or grooming service. Massages, manicures, haircuts, facials, and those poolside hair wraps all merit a tip of at least 15%. You can tip cast members involved in your (or your children’s) personal beautification at the Harmony Barber Shop, Bibbidi Bobbidi Boutique, or Pirates League. For the Barber Shop, tip about 15% of your bill. At one point tipping at the BBB had been prohibited, but in recent years this rule seems to have been relaxed. If you feel so inclined, you may offer a 15% tip to the Fairy Godmothers in Training or the Pirate tutors. Recreation: Offer a tip of at least 15% for any specialty recreation. This includes boat drivers, waterski instructors, parasailing guides, tennis instructors, and the like. For golf instructors and caddies, use standard golf club etiquette on tipping. Childcare: A tip should be offered to Disney’s in-room sitting subcontractors such as Kids Nite Out. This could range from rounding up the bill by a few dollars to an extra $100 or more if the real-world version of Mary Poppins has tamed your unruly mob. For a normal, competent sitter, a tip of $10-20 is a nice gesture. That certainly sounds like a lot, and in some cases it can be. But there are also many Disney service people that do not require tipping. In general, cast members working in the theme parks, with the exceptions of dining and personal care staff mentioned above, doing their regular job in the parks are not allowed to accept tips/bribes/grift/etc. If they are seen accepting tips, this is grounds for dismissal. You can’t give them a twenty to speed you through the standby queue at Soarin’, nor can you tip them for offering you kindness or special attention. Disney transportation on property: The bus/boat/monorail drivers should not be tipped. Counter service restaurants: No tipping needed here. If you’re on a strict budget, eating counter service meals (many of which are quite tasty, healthful, and substantial) is not only less expensive from a food cost standpoint, but also eliminates a potentially large gratuity expense. Some guests, knowing the no-tips rule for in-park cast members, will bring a stash of thank you cards or tiny treats from their home town when they go to the parks. They’ll offer these to cast members who have shown them a special courtesy. Cast are allow to accept these de minimus tokens. While giving a kind cast member a Statue of Liberty pencil sharpener is nice, what’s even better is giving the cast member some documented props. Guest comments weigh heavily in cast member performance evaluations. Your positive remarks can help good cast members get promoted into better jobs. To make an official comment, pick up a comment card at the Guest Services office at the parks. If you’d rather wait until you get home, you can send comments to: Walt Disney World Guest Communications, PO Box 10040, Lake Buena Vista, FL 32830-0040. The e-mail address for Guest Communications is: wdw.guest.communications@disneyworld.com. Be sure to include the cast member’s name and hometown (both noted on their name tag), as well as a description of the cast member’s good deed and approximately where/when it happened.You can also deliver a #CastCompliment by tweeting to @WDWToday. Bonus points if you include a photo of the cast member you’re complimenting. Occasionally, you’ll get a response with a photo of your honored cast member holding a certificate with your tweet printed on it.